Seth Greeves pulled off a matchwinning save as Boston Town beat Peterborough Northern Star on penalties last night. The young keeper pushed away the eighth spot kick of the night as the Poachers progressed 5-3 from 12 yards. But it had looked like the away side were to be exiting the UCL Knockout Cup as they trailed 1-0 until Harrison Holland’s injury-time equaliser. From that point on the Poachers were clinical, converting all of their penalties against the UCL Premier rivals. 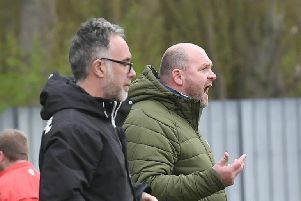 Following the 5-0 defeat to Eynesbury, new boss Gary Edgley had said the honeymoon period was over and it was time to be judged on his upcoming five matches. Since then the club have picked up their first win of the season, against Wellingborough Whitworth, and edged past Northern Star. They will be looking to keep that run going at Newport Pagnell Town on Saturday (KO 3pm).